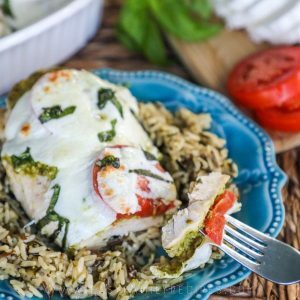 This simple Caprese Chicken recipe always impresses! The chicken covered in pesto, tomatoes and creamy mozzarella has delicious flavors and feels like a fancy meal, but only takes minutes to put together with only 4 simple ingredients and one dish. It is perfect for guests but also great for a quick family dinner, and is one of those recipes we make over and over again since it has that perfect combo of simple to make and lick your plate good! We might make this recipe more than any other. There aren’t many things that compare to the combination of simplicity and flavor in this dish. I also love that it is something that I can make that looks fancy, and very impressive but only takes a few minutes to put together. With 3 crazy kids there isn’t much in the world that makes me feel put together these days, ha! This recipe is similar to my Bruschetta Chicken recipe that we love so much, but even easier to make! Beyond the fact that this is just really delicious, it can be served with a variety of options to cater to what your family likes or any special dietary needs. This recipe is naturally gluten free and low carb, so it is friendly for many diets. One of the things I love most about this dish is that it can be served in so many ways. This dish is great warm from the oven served over a starch or greens and for a special treat drizzle it with balsamic glaze! (Balsamic glaze can be found at the grocery store near the balsamic vinegar.) I will share both my favorite traditional ways to serve it and also low carb serving suggestions. I think a combination of a couple of options from the list below makes a perfect meal. Rice– serve over wild, white or brown rice or with a side of risotto. Potatoes- One of my husbands favorite ways to eat this is over creamy mashed potatoes, with a side of smashed potatoes, or it would also make a great topping for baked potatoes. Pasta– You can serve this right over pasta tossed with olive oil or butter and garlic or with additional pesto. Bread– This goes great with a loaf of french bread or a crusty baguette. You can also make garlic toast or garlic cheese bread and serve it with or right on top. This works great to soak up the juices. Sautéed greens– My personal favorite way to eat this is over sautéed spinach. You can use any green you prefer, kale, collard greens, etc. Veggies– add a side of veggies like broccoli, green beans, brussel sprouts etc. Cauliflower– You can serve this with roasted cauliflower or use cauliflower as a low carb substitute for some of the options above like cauliflower rice, or cauliflower mashed potatoes. Salad– a side salad pairs perfectly to this dish. You can use a few veggies like tomato, carrots, cucumbers and an italian or balsamic dressing. I think the perfect meal is a combination of of a few of these options, like served over rice with a side of broccoli and some crusty bread, or similar. If you have a way that you serve this dish that I missed on my list, please let me know in the comments so I can try it out! I am going to share some of my tips, tricks and notes for this recipe below, if you have questions, there is a good chance I will answer them here! To find the full printable recipe card, scroll down to the bottom of the post. 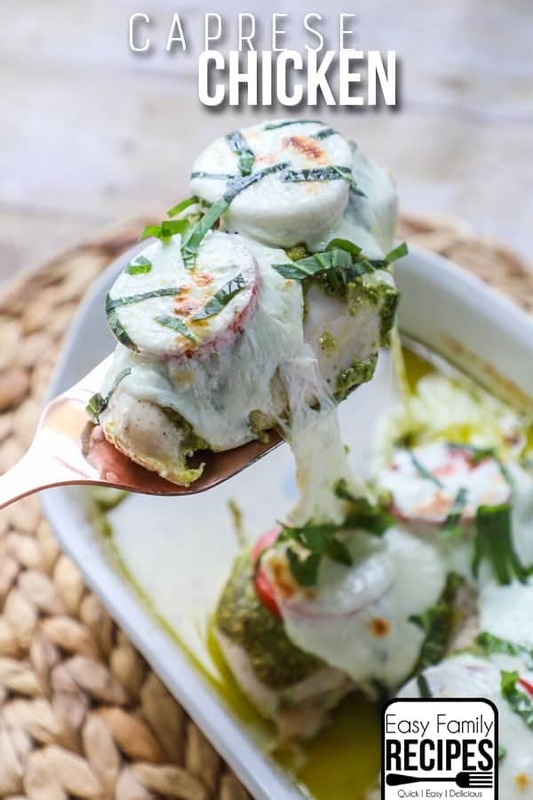 Since this recipe has so few ingredients, the key to good flavor in this dish is using great quality pesto, tomatoes, and mozzarella. Chicken– I use regular boneless, skinless, chicken breasts. If they are frozen they need to be thawed before you make this recipe. If your chicken breasts are thick, I would recommend cutting them in half so they are thinner and will cook more quickly and get more flavor in each piece of chicken even if it doesn’t look the same as the pictures here. Pesto– I like the pesto that both Costo and Sam’s Club carry and almost always keep a jar on hand. I also have used the Buitoni brand pesto that you can find in the refrigerated section at most local grocery stores. I think the flavor of the refrigerated pestos is better than jarred (non-refrigerated) pestos, but again it is a personal preference so if you have a brand you love, use it! If you don’t want to buy the pesto or you can’t find it locally, pesto is simple a sauce made of blended basil, garlic, parmesan cheese, pine nuts, and olive oil and is easy to make at home. This is a great homemade pesto recipe. Tomatoes– I like to use roma tomatoes. I think they have great flavor and they seem to be the perfect size for layering onto the chicken. You can really use any tomato you have on hand though, even halved cherry tomatoes would work in a pinch! Mozzarella– Fresh mozzarella is a key ingredient in traditional caprese flavors so I recommend using it in this dish. You can find this at most grocery stores and even Walmart, but sometimes it is not in the cheese section and instead in more of a specialty case near the deli. If you are in a pinch you can use regular grated mozzarella but the flavor and creaminess of the cheese won’t be quite the same. Once everything is assembled you can pop it in the oven. It is always tricky to recommend cooking times since based on how your oven cooks, your altitude and climate, the cooking time can vary. I do have a few tips to help you get the best result though. I always cook my dish on the middle rack. I do not cover the dish while baking. 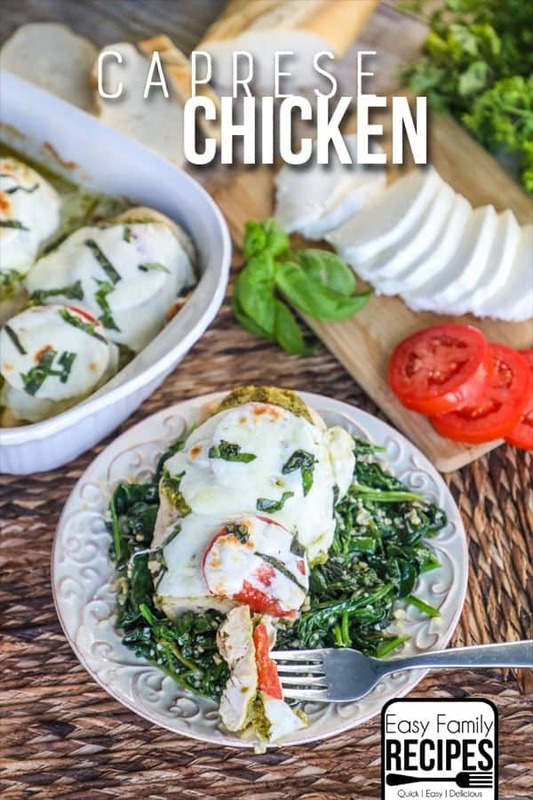 Since the oil in the pesto will melt and the chicken and cheese will release additional juices, cooking the Caprese Chicken uncovered helps some of that liquid to evaporate. I have not had a problem with the cheese getting too browned, but if your oven cooks differently and you are getting more browned than you like I would recommend cooking uncovered until that point and then covering the dish loosely with a piece of foil until it finishes cooking. When the chicken is done cooking there will be juices in the bottom of the dish. I love to set the chicken on top of the rice, mashed potatoes, or whatever I am serving it with and then spoon some additional juices on top to really get the flavor mixed in. Leftovers of Caprese Chicken (if you have any!) might even be the best part. To store leftovers you can place them in an airtight container in the fridge for 3-5 days or in the freezer for up to a month. I like to divide the leftovers into portion sized containers before I freeze it so it is easy to take out for a new meal. Caprese Chicken Salad– If you want to eat this for lunch the next day, chop up the leftover chicken (cold or warm) and add it to a bed of greens with grape tomatoes, and crunched pita chips, and any additional veggies you like such as artichokes, olives, sweet bell peppers etc and toss with Italian dressing, balsamic vinaigrette, or some additional pesto mixed with ranch or caesar dressing. Toss hot pasta with butter and garlic then add heated caprese chicken leftovers, additional cherry tomatoes and a little parmesan cheese and toss. Toss hot pasta with alfredo sauce. Chop and warm the leftover caprese chicken, then toss it with the alfredo chicken. Add an extra spoonful of pesto for an extra treat! Caprese Chicken Pitas– Spread a thin layer of pesto into the inside of a pita pocket. Chop up leftover caprese chicken and stuff into a pita pocket. Top pita with arugula or spinach, and extra tomatoes, mozzarella, or other toppings as desired. I really hope that you like this recipe as much as our family does! If you do get a chance to make it, I would love to hear about it! You can leave me a note in the comments (also please leave a rating as it helps others find my site!) or if you share a pic of your meal tag me in Instagram @easyfamilyrecipes. Nothing makes me happier than seeing you make the recipes I share! This simple dish is packed full of delicious flavors. It is perfect to serve for guests, or just for your own family. With only 4 ingredients and one dish, it comes together quickly and is easy to clean up! Lay the chicken breasts flat in a baking dish. Spread 1 tbsp of pesto evenly on each chicken breast. Top with tomato slices and cheese. Garnish with fresh basil and serve with your favorite sides. Enjoy! If your chicken breasts are thick, I would recommend cutting them in half to make them thinner. You can also cut the chicken into chunks or use tenderloins. If you do cut the chicken or use tenderloins, the cooking time will probably be reduced. Caprese Chicken leftovers can be stored in an airtight container in the fridge for 3-5 days or in the freezer for up to a month. This recipe is naturally gluten free low carb and friendly for low carb and keto diets. What a great serving idea! I never have the patience for much prep work so I live off these easy prep recipes! I didn’t see a cooking temperature. Sorry about that! Sometimes there are so many details I try to include I look over the obvious ones! It is fixed! Made this tonight & paired it with steamed cauliflower & steamed carrots. Absolutely wonderful! Thank you so much for sharing low carb meals that are absolutely delicious!! My husband raved about it & he’s never had anything pesto. I am so glad you all loved it so much! I love using pesto to cook. So much flavor is packed in there! I hope you get a chance to try some more of my chicken recipes! Family loved the dish. Didn’t tickle my fancy..
Omg thank you. This was such a hit tonight and I’m sure it will be even better tomorrow. So glad you enjoyed it Tammy! Thank you for your kind words. I hope that you get to try some of my other easy chicken recipes too! Hope you enjoy it! It is a regular on our meal rotation! Has anyone used boneless thighs? Does the dish go in covered or uncovered? Can you prepare this ahead of time and freeze it? Can’t wait to make this. Is there any reason I can’t highlight, cut and paste myself. I don’t like using the “print” on the page because it usually uses up too much paper. Thank you. No you should be able to cut and paste. I do it on my site all the time. Maybe try restarting your computer? I made this last night and it was absolutely wonderful. I used boneless thighs and they worked perfectly. We had bread to soak up the scrumptious juices. Simple, fast to prep, and only 4 ingredients. Thank you for the recipe. 5 stars. I would give more stars if I could. Made this tonite and it was a big hit! Super easy and so delicious. We’ll definitely be making this again. I just made this tonight. My family is really picky and I was afraid to serve it but it smelled so good by the time I served it everone was anxious to try it. They loved it! I served it over chicken and rice pilaf. Thank you for sharing this. My family told me they want again. This was so flavorful, such a hit, & easy to make! I cut the beasts in half to make sure they would cook through, plus I wanted more cheese & tomato on my chicken! I used a 9×13 casserole dish. When the chicken was cooked through, all those yummy juices were perfect to drizzle over the rice & Chicken! Thanks for this recipe, I’ve already shared it with a couple foodie friends! This was delicious and easy! My husband is not a fan of chicken breasts but really enjoyed this. Thanks for a great recipe.